Do you consider Chicken Fried Bacon with Cream Gravy Sauce a Health food? Do you think nothing of fried Oreo Cookies or fried cheese cake on a stick? Do you find even the most extreme fired food to be too mundane? Then have I got the Lunch for you. The Pizza Hut Double Roll. 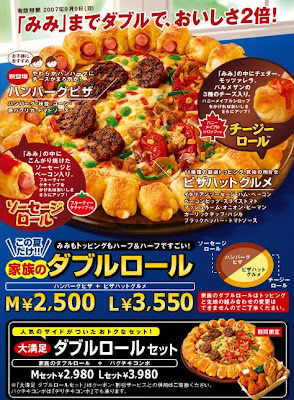 The crust is stuffed with cheese and Vienna sausage, while miniature hamburger patties are one of the toppings. Feast your eyes on the greatest pizza ever created! Forget cheese being the only ingredient in a stuffed-crust pizza, Pizza Hut’s new Double Roll sticks hot dog sausages in there too. It’s also lovingly sprinkled with hamburger pieces for the full fast food meat experience. The medium size costs 2500 yen (£10/$20.50) while the large will set you back 3550 yen (£14/$29).